The discovery of a 2,500-year-old dagger in Hubei province might prove that the states of Sui and Zeng were actually the same. Wang Ru shares his findings. Huang Fengchun, a leading archaeologist in Hubei province, has been receiving congratulatory messages from fellow archaeologists ever since he unearthed a bronze dagger in January. The treasure is 21 cm long and at least 2,500 years old, with a nine-character inscription on it, which literally means "dagger offering to the Great Minister of War of Sui". It is now wrapped and kept in the storeroom by his office that looks like an air-raid shelter, in the basement of Suizhou Museum. "It was buried with the owner of the tomb, who might be the minister of defense of the State of Sui," explains Huang, who is also a researcher with Hubei Relics and Archaeology Institute. 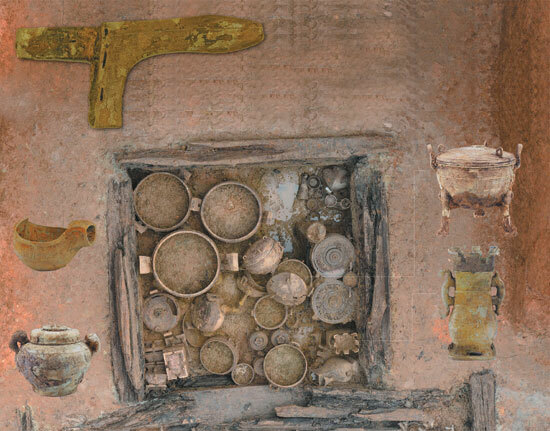 Huang's team also excavated more than 1,000 pieces of historical relics, mostly bronze vessels and weapons from the Eastern Zhou Dynasty (770-256 BC) in Suizhou, a city in Hubei province. Most relics have inscriptions reading "the State of Zeng", except the dagger. Compared to the abundant relics unearthed in Suizhou, such as the chime bells unearthed from the 2,400-year-old tomb of Marquis Yi of Zeng State in 1978, the dagger looks quite ordinary. But the character "Sui" on the dagger makes it priceless because this is the first time a relic had the character engraved on it. It represents the State of Sui, a vassal state of the Eastern Zhou Dynasty. "It could be an important discovery to solve the puzzle of Sui and Zeng states, which historians have been debating for a long time," Huang says. In 2009, when a bronze vessel was uncovered in a muddy construction site in Suizhou, the whole project stopped immediately. Since June 2011, Huang and his fellow archaeologists from Hubei Relics and Archaeology Institute have discovered 68 earthen and brick tombs at the site.